Each lozenge contains 2.4mg of Hexylresorcinol. Also contains liquid sucrose, liquid glucose and propylene glycol. 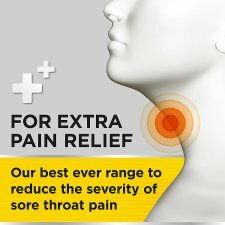 Sore Throat Pain Relief Honey & Lemon Flavour 2.4mg Lozenges contain an active ingredient (Hexylresorcinol) for use in throat medications. It is used for the symptomatic relief of sore throat and its associated pain. Do not store above 25°C. Store in the original packaging. Keep in the outer carton. How to use: Strepsils Sore Throat Pain Relief Honey & Lemon Flavour 2.4mg Lozenges are suitable for Adults and Children (over 6 years old) and the elderly. Not suitable for children under 6 years. Dissolve one lozenge slowly in the mouth every 3 hours. 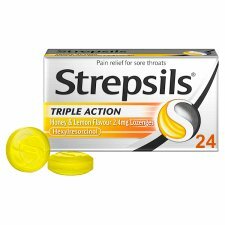 No more than 12 lozenges in 24 hours. Do not take more medicine than the label tell label tells you to. For oral administration only. Remember young children can choke on lozenges. If you are allergic to any of the ingredients do not use this product. If you are pregnant, or if you have been told by your doctor that you have an intolerance to some sugars, contact your doctor before taking this product. Consult your doctor or pharmacist if: You take too many lozenges Anything unusual happens If symptoms persist consult your doctor. Do not use after the expiry date. KEEP ALL MEDICINES OUT OF THE SIGHT AND REACH OF CHILDREN.